St Felix sits just off busy Hamilton Road in this jolly Edwardian seaside town. Felixstowe is usually ignored by explorers of Suffolk, which is a great pity, since it contains much of interest from the last 100 years or so. There is Suffolk's largest hotel, there is also Suffolk's finest Victorian church, St John the Baptist, and England's first reinforced concrete church, St Andrew, as well as a host of fascinating domestic architecture, especially from the 1890s and 1930s. St Felix does not stand out like these famous churches, but has a quiet, dignified presence behind its courtyard and wrought iron fence, with the presbytery to the left and fine modern hall to the right. This is in a dynamic form of Suffolk vernacular, and replaced a smaller hall which the parish had outgrown. St Felix was built in a restrained Gothic style, at that moment when Decorated became Perpendicular towards the end of the 14th century - except, of course, that this is actually an early 20th century building, and was not subject to the Anglican scrutiny of a Phipson or a Cautley, and so breaks the rules rather delightfully. The original church on this site was built in 1899, when Felixstowe was a far outpost of the Diocese of Northampton, a town which few parishioners here can ever have visited. Before that, Mass had been said upstairs in a tea room on the Orwell Road. The first church was where the presbytery is now, and it was a wooden hut, although later photographs show it covered, rather attractively, with ivy. The original plans for the new church were grand indeed, and incorporated a presbytery for three priests and two live-in servants! However, the current church was built in 1912, largely to the designs of Suffolk architect Francis Banham - with one major exception, as we will see. We enter through the west porch, and are faced with several sets of double doors, glazed to create a Galilee effect. This porch was built as recently as 1958; until then, the west end incorporated two vast, barn-like doors which opened directly into the nave, roughly where the inner doors are today. The one problem with Banham's design was the grand mock-Tudor west end, with its squat tower. It became clear fairly early on that this would never be built, and, in any case, the current west end is much more fitting. There is a baptistry tucked in to the south side, with a most elegant font. You step into a wide, squarish nave, your eyes instantly drawn to the fine east window, an external view of which is, unfortunately, rather difficult to obtain. It shows the 15 mysteries of the Rosary, and was reset in the 1980s. As with the rest of the glass in the church, it is the work of Hardman & Co, and this is the largest collection of that workshop's output in all East Anglia. A modern, Vatican II altar sits towards the nave, replacing a grand, east-facing sanctuary that survived barely ten years. Even while it was being fitted out in 1963, the bishops in the Vatican were opening the windows, and letting the fresh air blow in. The Catholic Church would be different from now on. Either side of the nave are narrow aisles beyond the arcades, and the stone crossbeams of the aisle roofs are extended downwards to contain Stations of the Cross. This is most effective, I think; we are used to seeing them on south and north walls, but here you get a real sense of a processional way beneath them. In fact, this is a fairly recent development, and they were in heavy wooden frames on the outer walls until a few years ago. At the east end of the north aisle is a Sacred Heart altar, and the south aisle ends in a little Lady chapel. Turning west, the church is full of light and space, with its high roof and gallery. Before the Reformation, this parish was divided between the parishes of St Peter and St Paul, Old Felixstowe, a mile to the east, and St Mary Walton, a half mile the other side of Hamilton Road. But after the priests there were swept away, it was 350 years before a Catholic sacramental presence returned to this place. Today, a board of priests of the parish hangs in the nave - a rare thing in a Catholic church, but a good thing. This is a lively parish, and has seeded itself into neighbouring Trimley, where Suffolk's most modern Catholic church, St Cecilia, will be found. 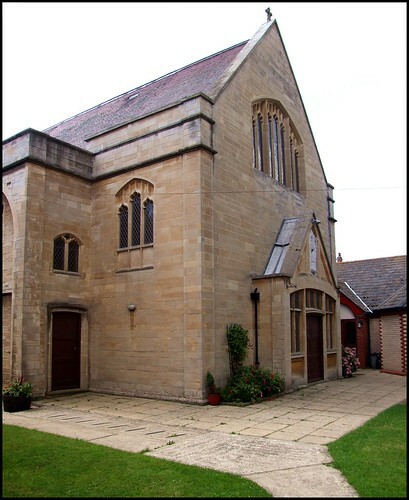 The parish also includes the Convent of Jesus and Mary - coincidentally, in Orwell Road, where this parish celebrated its first post-Reformation masses in a tea shop more than 100 years ago. The Catholic Church is very good at dedicating its churches appropriately, taking local history and devotion into account. So, in Suffolk, we have St Etheldreda at Newmarket, for example, and St Edmund at Bury. Although it is unlikely that the town of Felixstowe itself is named after St Felix - more likely, it takes its name from Fylthestow, meaning a place where something is cut, probably trees, or perhaps meadowgrass - there is a local connection with St Felix. The neighbouring parish of Walton contained Walton Castle, which was probably the Dumnoc where he first came ashore to convert the heathen English, and the place he established his See, before moving on to the wilds of Norfolk.